For those working at heights, ladders are in everyday use. Getting on and off the roof using a ladder seems like a fairly straightforward process, but ladder-related incidents lead to a large percentage of injuries both in the workplace and around the home. Many common maintenance jobs such as gutter cleaning, window cleaning, roofing repairs and gutter repairs require the use of a ladder. Ladders pose a significant risk and precautions need to be taken to use them in a safe manner. Many injuries result from using ladders in the wrong location, resulting in incidents with overhead wires, unstable footing and passing pedestrian traffic. These risks are significantly reduced by either using an extra person to assist while using a ladder or by installing safety points in and around a building. What does a Ladder Bracket do? Ladder brackets make working at heights on a ladder or roof safe. Ladder brack ets are a device permanently fixed to a roof or wall that enables a ladder to be safely secured in place by just one person. It secures the top of the ladder from moving and holds the ladder firmly in place as the user climbs and accesses the roof and climbs down again. 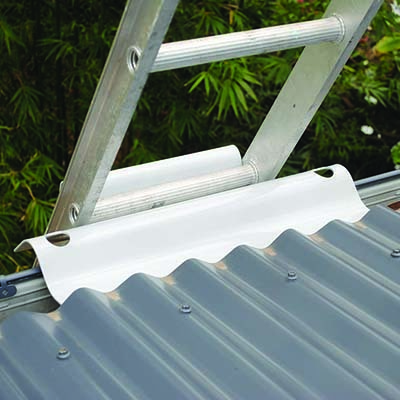 It also protects your gutters from damage or scratches from ladders. Australian WHS/OH&S regulations stipulate that while working with a ladder it needs to be tied off or secured. Ladder brackets allow this to occur without having to carry extra tools or devices to secure the ladder. The bracket allows for easy ladder positioning and a secure area to simply and quickly attach a safety tie to the ladder. Where to install a Ladder Bracket? Ladder brackets are installed where access to a roof requires the use of a ladder. When Sydney Anchor Points Certified Installers install an access point they examine the best location for a ladder to be used on a particular building. Choice of Ladder Bracket placement will consider potential hazards such as the surrounding ground level, overhead wires, pedestrian traffic, roof accessibility and roof anchor points. Once the location is selected the appropriate type of ladder bracket is selected and is installed, either wall mounted or roof mounted. Installation of the appropriate ladder bracket is relatively straightforward and has little visual impact. For metal roof installation a few roofing screws are removed and the ladder bracket slides easily under the roofing sheet. Tiled roofs required 1 or 2 tiles to be temporarily removed, the ladder bracket is then fixed to the rafters before replacing the tiles. Wall mounting the ladder bracket may be required, in such a case the appropriate fixing method for the wall type is used. Should I Install Ladder Brackets? As ladders are primarily a means of access and egress, many falls take place when people are working from ladders. Not only does working from a ladder reduce the movement of a worker but is often uncomfortable as there is a need to stand on the narrow rungs for a long time and holding your arms above your shoulders starts to stress the musculoskeletal system. Ladder brackets also referred to as ladder stabilisers, provide a safe and secure support for a ladder and prevent slippage and horizontal movement. What Type Of Ladder Brackets Does Sydney Anchor Points Install? Sydney Anchor Points uses LadderLink ladder stabilisers. Over the years, our team of height safety experts have tested numerous ladder brackets and we have established LadderLink ladder stabilisers as an excellent choice for properties in Sydney. The LadderLink units have multiple securing points which can be used to tie off the ladder thereby providing a safe roof access point. Manufactured from high tensile marine grade aluminium, the LadderLink brackets do not cause premature corrosion to gutters and roof sheeting like inferior ladder brackets that do not have a protective coating. Over the last ten years, the SafetyLink design team has been refining their designs to ensure maximum protection, ease of install and ultimate durability. In 2009, SafetyLink won an award for their designs on the ABC1 programme The New Inventors for the unique energy absorbing features of their fall prevention systems. Sydney Anchor Points have installed thousands of ladder brackets on residential, commercial and strata properties in the Greater Sydney region. The experienced team of height safety experts can install LadderLink ladder brackets on tiled, steel or metal roofs. Sydney Anchor Points have a number of products suitable for various uses, including wall mounted ladder brackets, extended ladder brackets, gutter protectors and fixed LadderLink ladder stabilisers. As industry professionals, our ladder bracket installers comply with all relevant OHS legislation and regulations. When you book an appointment with Sydney Anchor Points, you can be sure that we will arrive on time with all of the equipment needed to get the job done safely. If you have any questions about whether ladder brackets will suit the unique requirements of your property, give us a call on 02 8020 5775 and one of our qualified team members will assist you. We service commercial, strata and residential properties all over Sydney, from Bondi to Penrith and from the Sutherland Shire to Hornsby. If you have an already existing ladder bracket on your property and you need it certified, give us a call and we can arrange for one of our qualified ladder bracket certification specialists to provide you with a cost-effective certification service. We are well known for our extensive range of height safety services including installing and certifying roof anchor points, safe roof access systems and roof access hatches. All of the anchor points that we install are designed and manufactured in Australia in accord with the Australian and New Zealand Standards of Safety (AS/NZS 1891.4 and AS/NZS 1891.2).